The term ‘structural crashworthiness’ is used to describe the impact performance of a structure when it collides with another object. 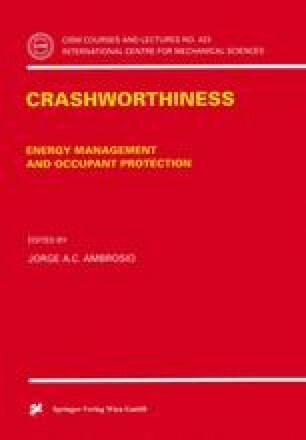 A study into the structural crashworthiness characteristics of a system is required in order to calculate the forces during a collision which are needed to assess the damage to structures and the survivability of passengers in vehicles, for example. This topic embraces the collision protection of aircraft, buses, cars, trains, ships and offshore platforms, etc. [5.1–5.7] and even spacecraft [5.8]. No attempt is made to review the entire field and only that part which is related to dynamic progressive buckling introduced in the previous chapter is discussed briefly.